©2000-2005 North American Vexillological Association - All Rights Reserved. The following was originally published in NAVA NEWS Number 167 (April-June 2000) with an addenda in NAVA NEWS Numbers 168 (July-September 2000), 178 (April-June 2003) and 188 (October-December 2005). The 13 Stars and Stripes was born on June 14, 1777 by resolution of the Continental Congress. 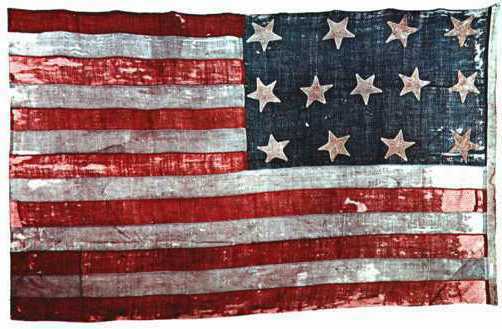 Unlike subsequent variations, the first US Flag has been made and used almost continuously ever since. Even today, you can purchase a brand new copy and, keeping with the tradition of the original flag, it is available in several different specifications. This fact, however, also raises issues when someone comes upon an old 13 star flag. Often inquiries to NAVA are made regarding the value or care of an "authentic" relic from the Revolutionary War. I have related the story of the US Navy's "Boat" Flag countless times and often have to remind people that crafters still hand sew even today and that the sewing machine was not invented until 1841. This spawned the idea to collect as many images as possible from the period when this flag was official for comparative analysis. The criteria followed in this presentation is basically any image of a 13 stars and stripes flag dating from the 18th century. 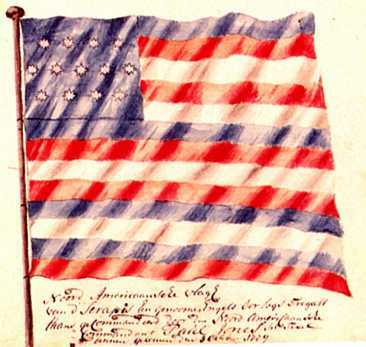 Although the 15 star, 15 stripe flag became official in 1795, the period for this analysis is 1777 through 1800. 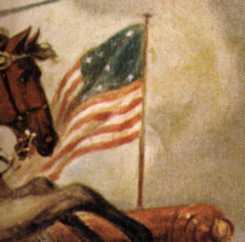 Several artists were working on historical paintings by 1800 who presented specific views of the first flag, particularly depicting use during the Revolutionary War (however improbable). 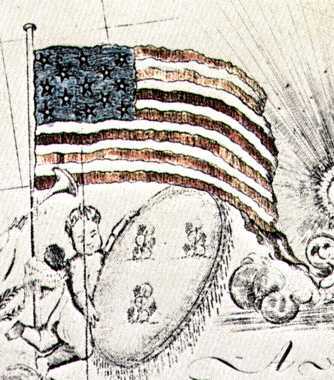 Excluded are any flag images that only included one of the two elements, the 13 stars or the stripes and images known to have been produced after 1800. In addition, I have tried not to include any image of questionable date. 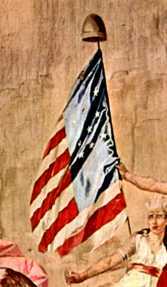 Specifically excluded were flags traditionally thought to date from this period that have been conclusively dated by the Smithsonian (and others) as being later. 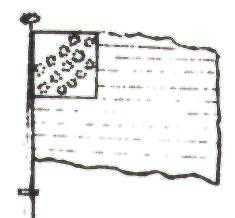 Specifically the following flags: Bennington, Curtis-Clinton (2 flags), Easton, Hulbert, Porter, Schuyler, Schuyler-Hamilton (these last two should not be confused with the General Schuyler Flag), Third Maryland (Cowpens), and Robinson (or Posey). It should also be noted that this exercise uncovered an overlooked feature on one flag that casts doubt on it being an 18th century piece, numbered 21 below, General Schuyler's Flag. The shield on the US Arms bears 17 pales, the correct number for the period 1803-1812. 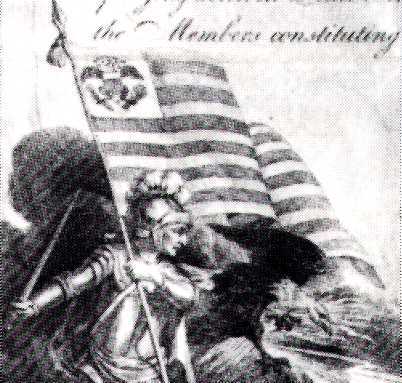 It is this author's opinion that this flag may date from this later period. 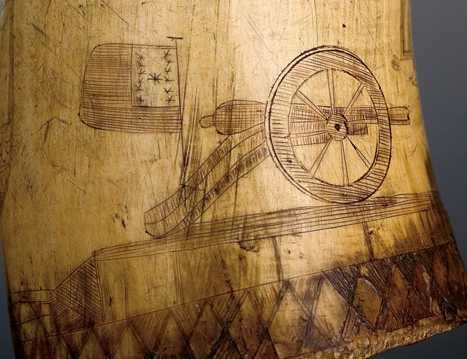 For comparison, the shield on the arms of the Waldoboro Light Infantry Color signed and dated 1809 shows 17 stripes and the shield on the Thomaston Cavalry Color believed to have been made in 1799 shows 16 stripes. Both of these are the correct number for the dates given. Also excluded are eight flags from Boleslaw Mastai's book claimed to be of this period without any discussion of their dating technique, specifically "Hancock and English" (pg. 38), "3rd MD Pattern" (pg. 44), "L'Enfant Type" (pg. 46), "Prisoner's Flag" (pg. 62), "Sea Captain's Flag" (pg. 63), "Minerva Flag" (pg. 66), "Another Revolutionary Flag" (pg. 66), and the "13 Star Great Star Flag" (pg. 101). If Mastai is to be believed, he holds the world's greatest collection of Revolutionary War flags. 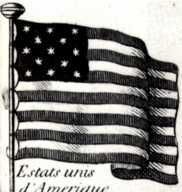 I was only able to uncover four Stars and Stripes flags dating with any certainty from the 18th Century, and only two of them can be dated to the Revolutionary War period. It should be noted that this presentation is not exhaustive. The images presented are those that have been published in several major books; there are references to others that were not illustrated. The author would appreciate copies or references of any further illustrations for this series. It should also be noted that these existing sources represent perhaps only a fraction of the total documentation that may have once existed. Any conclusions drawn should be considered very preliminary and subject to further findings and analysis. The data collected represents mainly American sources, 64%, while the balance are strictly European. The latter breaks down to 13% French, 8% British, 8% German, 5% Dutch and 3% Italian sources. 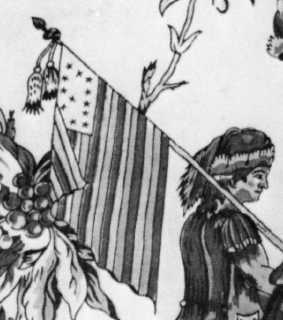 So, what did the 13 stars and stripes look like in the 18th century? A technical analysis of the data given below reveals some interesting facts. Considering only the American sources, no source shows the stars arranged in 3-2-3-2-3 until 1782 (after the Revolutionary War). 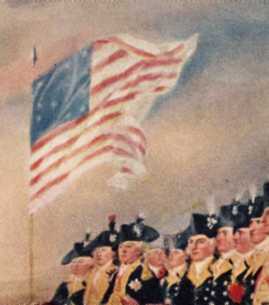 Of all other known extant American flags from the Revolutionary period, just three have stars in rows of 3-2-3-2-3, the two Rhode Island Regimental colors and the so-called Valley Forge Flag of Washington's Headquarters. The former two cannot be dated with certainty any earlier than 1784 and the latter is suspected by some experts to be the canton from a possibly later Stars and Stripes. Primarily the stars in Revolutionary War America were arranged in three rows, usually 4-5-4. After the War, this arrangement still predominated but the circle or oval of stars was nearly as popular. Only two show 3-2-3-2-3. 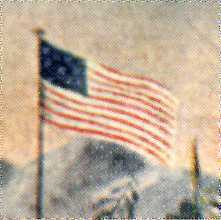 Stripe colors in the American sources are exclusively red and white during the War (almost all beginning and ending with red) and nearly so afterwards although there are more beginning and ending with white. 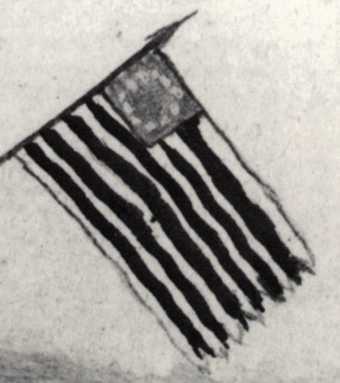 Only one American source shows a tricolor stripe arrangement, dating from 1787. 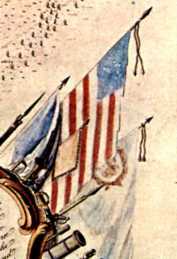 It should be noted that the two Dutch paintings of the flags of the "Alliance" and the "Serapis" were believed to have been painted from life with some measure of accuracy and would both be the exceptions to this sense, although it is suspected one or both flags were not made in America. Considering the number of points on the stars, it is a mixed bag and would appear that any number was used, even different numbers of points on the stars of a single flag (see 4 and 28, below, for example). The size of the cantons is also very variable, with no clear preference. It is interesting to note that there are three flags with red and blue stripes, all associated with southern states (numbers 7, 33 and 34, below). After the Revolutionary War, the star arrangements are very mixed. Indeed, even different illustrations by the same person vary greatly (see 26, 27, 32 and 42, below, for example). Among the European sources, the flag designs are somewhat different, with stars in rows of 3-2-3-2-3 being exclusive in the British sources and nearly so in the German sources. The German sources mostly show tri-colored stripes as well. 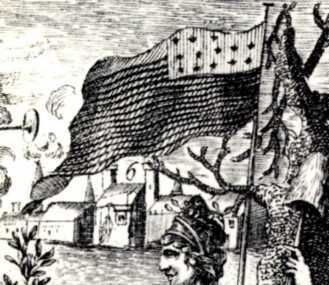 The so-called "French Alliance Flag" bearing a gold fleur-de-lys as well as the stars is shown only in two French and one German source in the period 1781-83. No American source shows it. Addenda: Since the above was written in 2000, eleven additional illustrations have surfaced (included below) that have offered some further information that seems to basically confirm the conclusions above. Of these illustrations, seven are American (numbers 1.1, 4.1, 23.2, 24.1, 26.1, 29.1, and 32.1 below) and only one of them shows the stars in rows of 3-2-3-2-3 (dated 1785). The other four are all British (numbers 23.1, 35.1, 35.2, and 35.3) and they all show this arrangement! Again, the star points are a mixed bag, although the majority of them seem to be five-pointed. Note: the following conventions are used in this presentation: "even" means the rows of stars begin and end vertically in line with other rows, even if there are different numbers of stars; "staggered" means the stars are set equidistant from each other in each row causing some rows to be shorter and some to be longer horizontally; "R" means red; "W" means white and "B" means blue. See the listing of image source codes. American; 1777 Sept. 11; Original at Independence National Historical Park. Field of solid red with stars and stripes canton. Stars: 13 eight-pointed R stars on W canton arranged 4-5-4 (even). Two upperhoistmost stars appear cut off. Canton: extends to 5th stripe. "Rests" on a W stripe. Stripes: 13 W-R, 7 W and 6 R.
American; 1779; Two original plates excavated at the Pluckemin archeological dig in Bedminister, New Jersey in 1979. The flag is engraved as a line drawing on the plates. The dig was reported in the local newspapers and that is the original source for the illustration. The site was occupied by the American artillery from December 7, 1778 until early June 1779. These items were found among other items of brass waste and it is concluded they were made on site. Stars: 13 arranged in even rows of 5-3-5, with the center row of stars centered under the first, third, and fifth stars in the other rows. No colors are indicated. Details too small to make out number of points. Canton: Extends to the 7th stripe. Stripes: Twelve, no colors indicated. There are 7 stripes next to the canton and 5 below it. Note: This image was added subsequent to the original article, hence the numerical designation 1.1. 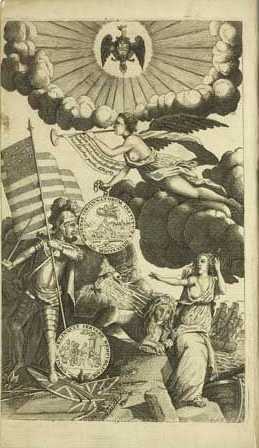 American; 1779 July 30; Original at the Pennsylvania Historical Society. Original is a monochrome sketch. Stars: 12 dark stars on a light canton arranged 4-4-4 (even). Details too small to make out number of points. Canton: extends to 6th stripe. "Rests" on a dark stripe. Stripes: 13 alternate dark-light, 7 dark and 6 light. Dutch; 1779 Oct. 4; Original at the Chicago Historical Society. Stars: 13 eight-pointed W stars on B canton arranged 3-2-3-2-3 (staggered). Canton: extends to 6th stripe. "Rests" on a W stripe. Dutch; 1779 Oct. 5; Original at the Chicago Historical Society. Stars: 13, 12 eight-pointed and 1 seven-pointed (second star in top row) W stars on B canton arranged 4-5-4 (staggered). Canton: extends to 5th stripe. "Rests" on a B stripe. Stripes: 13 irregularly colored B-R-W-R-W-B-R-W-R-B-W-B-R, making 4 B, 5 R and 4 W.
December 2, 2004, Cincinnati, Ohio for $3,500. The flag is engraved as black lines on the horn. Stars: 13, 12 depicted as 6-pointed and the center star depicted as 8-pointed, arranged in two vertical rows of 6 stars with one placed centered between the rows. The stars are engraved and colored black. Canton: Extends about two-thirds of the way down the flag. Hard to tell how many stripes down. Stripes: Appears to be more than 30, although some of the lines may be intended to indicate the flag is waving and not stripes. Exact number of stripes is not clear. Image source: Cowan's Auctions, Inc. Note: This image was added subsequent to the original article, hence the numerical designation 4.1. American; 1779; Original at the Smithsonian Institution. Original is a monochrome engraving. Design consists of a grouping of four US Flags. Stars: all are dark stars on a light canton, the first has 13 arranged 4-4-5 (even), the second has 13 arranged 4-4-3-2 (staggered), the third has 12 arranged 4-3-5 (staggered) and the fourth has 14 arranged 5-4-3-2 (upper two rows even and lower two rows staggered). Number of points indeterminate. Canton: the two flags that show completely have the canton extended to the 6th stripe. "Rests" on a dark stripe. Stripes: The first and fourth flags are shown in their entirety and both have 13 stripes, alternate dark and light, 7 dark and 6 light. The second and third flags are shown "cut off" such that you cannot see any stripes past the end of the cantons. They show 7 stripes each below the canton, alternate dark and light, 4 dark and 3 light. French; 1780 June 15; Original at the Newberry Library. 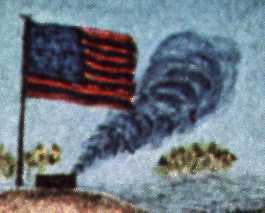 Original depicts the US Flag in a line drawing. Stars: 13 dark on light, apparently some having six and some eight points, arranged 5-4-4 (staggered). 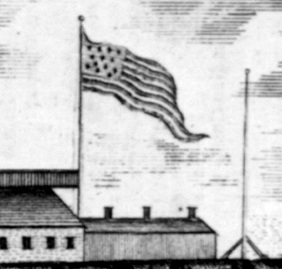 Canton: the flag is shown "cut off" such that you cannot see any stripes past the fly end of the canton. Assuming 13 stripes, the canton extends to the 6th stripe. Stripes: below the canton there appears to be eight stripes. British; 1781? Original at Colonial Williamsburg. 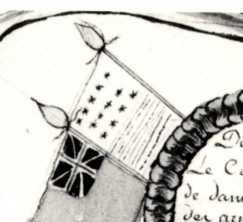 It should be noted that this small painting, probably painted by a British soldier across the river from the American lines, also depicts two incorrect British Union Flags, one upside-down Dutch flag and one correct British White Ensign. Stars: Indistinct dark stars on a blue canton. Canton: extends to the 10th stripe. "Rests" on a R stripe. Stripes: 13, alternate R-B, 7 R and 6 B.
American; 1781? (Used 1814); Original at the Massachusetts State House. 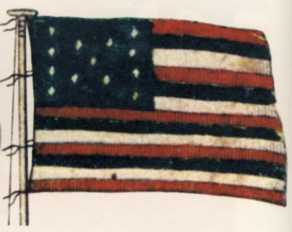 Mastai claimed this is the flag used in 1791 to receive the first British salute from a Man-of-War to the US flag. 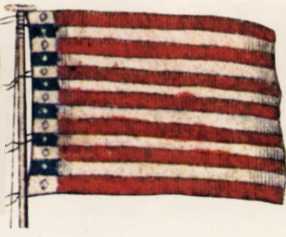 The flags documentation only claimed it was made in 1781 and displayed at the fort in 1814. Stars: 13 five-pointed W stars on a B canton, arranged 4-5-4 (even). Canton: extends to the 7th stripe. "Rests" on a W stripe. Stripes: 13 alternate R-W, 7 R and 6 W.
French; 1781; Original at Brown University. Also known as the Mondhare Flag Sheet. Quaife gives the date as 1781, but the identical image (with differences in hand-coloring) is on a chart dated 1791. 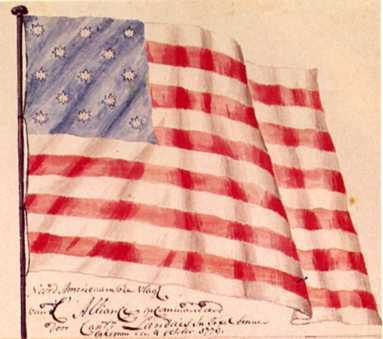 The flag illustration is hand colored in all known copies. Stars: 13 five-pointed (in some copies the artist was very sloppy and simply painted a "box" around each star and showing only 12) W stars on a B canton, arranged 3-3-3-3-1 (even) plus one gold or white Fleur-di-lis at the center top of the canton. Canton: extends to the 11th stripe. "Rests" on a W stripe. German; 1782; Original at Brown University. Also known as the Lotter Flag Sheet. The flag illustration is hand colored. Stars: 13 six-pointed W stars on a B canton arranged 3-3-3-3-1 (even with last star centered) plus one gold Fleur-di-lis at the center top of the canton. American; 1782; Original at United States National Archives. 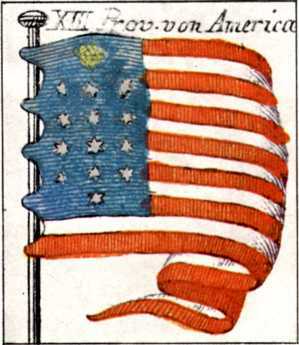 William Barton's first design no longer exists but it also included a flag with a circle of stars. Regarding the first design he wrote that the stars represent "a new Constellation. ... Their Disposition, in the form of a Circle, denotes the Perpetuity of its Continuance, the Ring being the Symbol of Eternity." Stars: 13 W stars on B canton arranged in circle. The stars are too small to determine the number of points but the border of the shield on the seal contains 13 eight pointed stars. Canton: extends to the center of the 5th stripe. Doesn't "Rest" on any stripe. Stripes: 13 alternate W-R, 7 W and 6 R.
American; 1782; Original at Brown University. The flag illustration is hand colored. Stars: 13 W stars on B canton, arranged 3-2-3-2-3 (staggered). They appear to be eight-pointed but the scale is very small. Canton: extends to the 4th stripe. "Rests" on a W stripe. Stripes: 11 stripes are visible alternate W-R, 6 W and 5 R.
American; 1782; Original at the Library of Congress. Abraham Weatherwise was the pseudonym of David Rittenhouse and the Almanack was published at Boston. The original is a monochrome engraving. Stars: 13 five-pointed dark stars on a light canton arranged 3-5-5 (even with top row over the last three stars of the other two rows). Canton: extends to the 8th stripe. "Rests" on a light stripe. Stripes: 29 alternate light-dark, 15 light and 14 dark. Widths of stripes varies somewhat. British; 1783 Apr. 3; Original at Henry F. DuPont Winterthur Museum. The original is a monochrome engraved print. The flag illustration is hand colored. Stars: 13 four-pointed stars, W on B, arranged 3-2-3-2-3 (staggered). Canton: extends to the center of the 7th stripe. "Rests" in the center of a W stripe. American; 1783 Apr. 24; Original at Yale University. Original is an ink line drawing over some faint pencil sketching. The available illustration is only a detail so the exact number of stripes is not shown. 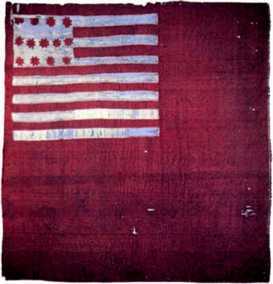 His diary describes it as having "The stripes red and white, with azure field in the upper part charged with 13 stars." He also describes the arms as those of the US but in this he erred. Stars: 13 six-pointed stars disposed around the arms of Pennsylvania, 3 and 3 on either side at the top, 2 and 2 in the center and 2 and 1 at the bottom, above the motto. Canton: extends to the 6th stripe. Stripes: presumably there are 13. 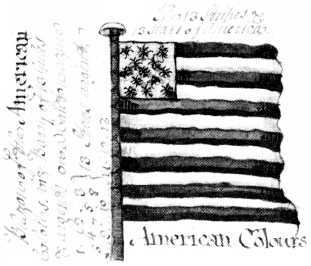 American; 1783 June 10; Original is in the Library of Congress, owned by the Society of the Cincinnati. The original is a monochrome watercolor. Stars: 13 five-pointed dark stars on a light canton arranged in an oval. Stripes: 13 alternate dark and light, 7 dark and 6 light. French; 1783; Original owned by the National Trust of Great Britain. The original was commissioned in 1783 by the King of France and was intended to be a gift to George Washington. The French Revolution intervened such that it was never delivered. Stars: 13 five-pointed W stars on a B canton arranged 3-3-3-3-1 (even with last star centered) plus one gold Fleur-di-lis at the center top of the canton. Stars are set somewhat high on the long canton. Canton: extends to the 10th stripe. "Rests" on a W stripe. Stripes: 12 alternate W-R, 6 Wand 6 R. Flag is folded at top in image and presumably there is a 13th W stripe at the top. British; 1783; Original at Brown University. The flag illustration is hand colored. Stars: 13 six-pointed W stars on a B canton arranged 3-2-3-2-3 (staggered). Canton: extends to the 5th stripe. "Rests" on a W stripe. Stripes: 13 R-W, 7 R and 6 W.
American; 1783; Original in the Library of Congress. Original is an engraved line drawing but is "heraldically hatched" to indicate color. Stars: 13 probably five-pointed W stars on a B canton arranged 4-5-4 (staggered). Canton: extends down to the 7th stripe. "Rests" on a W stripe. American; 1784; Original in the New Jersey Historical Society. The flag illustration is hand colored. Stars: 13 five-pointed W mullets (stars with a circle piercing the center) on a B canton arranged 3-2-3-2-3 (staggered). American; 1784; Original at Independence National Historical Park. Flag has a heavy red fringe around three sides. 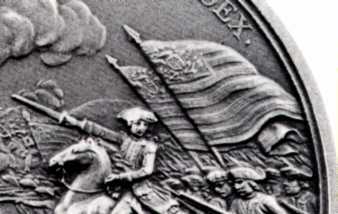 Although consistently dated by experts to the period "after 1784," it should be noted the shield on the US Arms bears 17 pales, the correct number for the period 1803-1812. 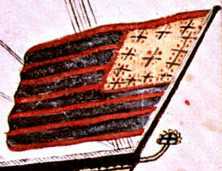 It is this author's opinion that this flag dates from this later period. Stars: 13 W stars, twelve five-pointed and one six-pointed (the last one) arranged in an arc over the Eagle. Canton: extends to the 6th stripe. "Rests" on a W stripe. German; 1784; Original at Brown University. Published by Haude and Spener at Berlin, this book contains twelve copper plate engravings of incidents of the American Revolution illustrating an account written by Matthias Sprengel, a professor at the University of Halle. 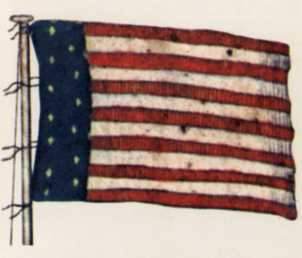 The flag illustration is hand colored in some editions. Stars: 13 five-pointed W mullets (see #21, above) on a B canton arranged 3-2-3-2-3 (staggered). Canton: extends to the 6th stripe. "Rests" on a R stripe. Stripes: 13 R-B-W, 5 R, 4 B and 4 W.
American; 1784; Original at the Maryland State House. 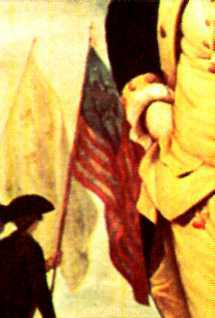 Peale also painted a portrait of Washington at Trenton in the same period showing a similar flag and a portrait of Samuel Smith showing what appears to be the Society of the Cincinnati flag, which is similar in design but has blue and white stripes and a white canton. 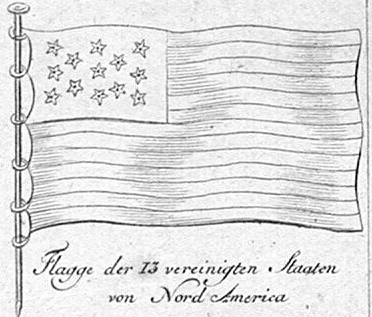 Stars: owing to a small scale, it is hard to determine but appears to depict 13 W stars on a B canton arranged above the US Arms. 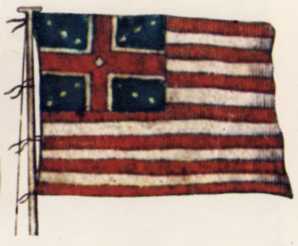 British; 1785; Original in the files of the Flag Research Center. This watercolor painting includes the heraldic blazon. Stars: 13 multipointed (probably intended to be 8-pointed) described as W, arranged in rows of 3-2-3-2-3 (staggered). Canton: B, extends to the 4th stripe. "Rests" on a R stripe. Stripes: 13 described as R-W, 7 R and 6 W.
Image source: FB, pg. 57. Note: This image was added subsequent to the original article, hence the numerical designation 23.1. American; 1785; Original sold at the Swann Auction Galleries, Feb 2nd, 2006 for $1,400. 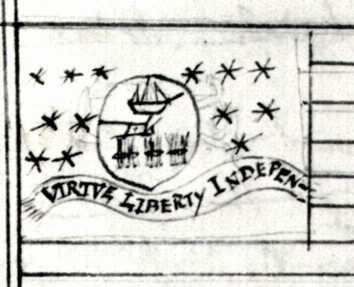 This engraving includes the National Society of the Cincinnati Arms. Stars: 13 multipointed (probably intended to be 6-pointed) W, arranged in rows of 3-2-3-2-3 (staggered). Canton: Probably B, extends to the 5th stripe. "Rests" on a W stripe. Stripes: 13 probably R-W, 7 dark and 6 W.
Image source: Swann Galleries, Inc. Note: This image was added subsequent to the original article, hence the numerical designation 23.2. French; 1785? ; Original owned by the Society of the Cincinnati. The original is a monochrome engraving. 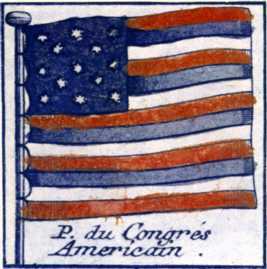 It is possible that this flag was not intended to be that of the US, but rather that of the Society which is of the same design illustrated with blue and white stripes. It was adopted in 1786 but may have been in the design stage earlier. Stars: 13 five-pointed dark stars on a light canton arranged in two arcs of 8 over 5 above the US Eagle Coat of Arms. Canton: extends to the 5th stripe. "Rests" on a dark stripe. Stripes: 13 alternate light and dark, 7 light and 6 dark. 1. 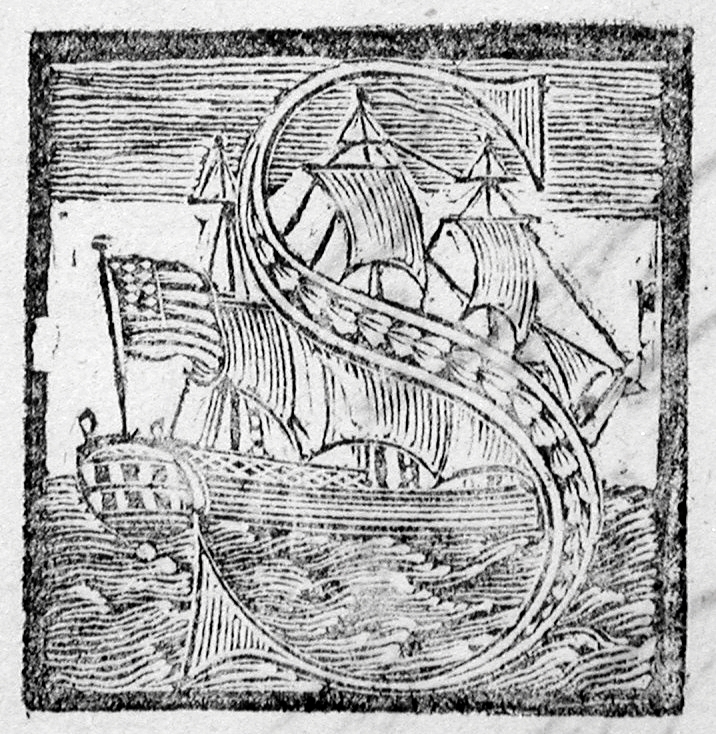 U.S. Ensigns (and pennant and jack) in engraving made at Philadelphia. 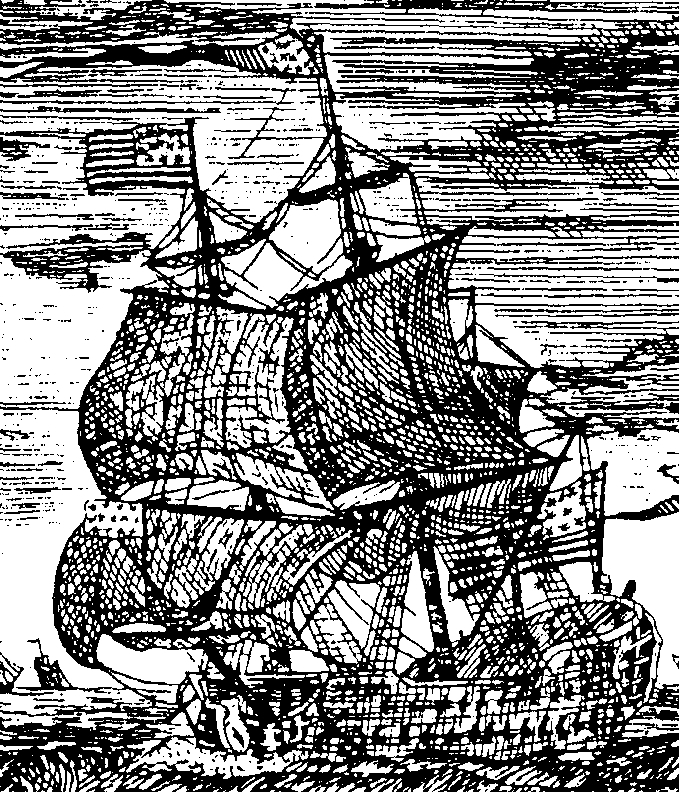 This engraving is part of a nautical scene. Stars: 13 multipointed (probably intended to be 5- or 6-pointed) dark on light, arranged in three rows of 5-5-3 (staggered) on one and 4-5-4 (staggered) on the other. Canton: Light, extends to the 9th stripe and one and to the 7th on the other. "Rests" on a W stripe. Stripes: 13 dark and white, 7 dark and 6 white. Image Source: Dr. Henry Moeller. Note: This image was added subsequent to the original article, hence the numerical designation 24.1. 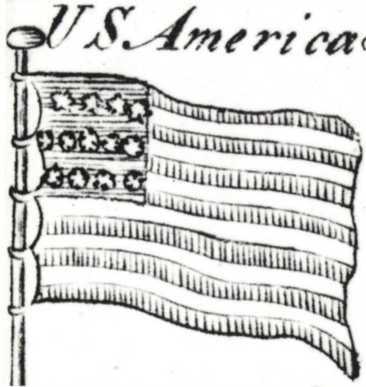 American; 1786; Original at the William L. Clements Library. Original is a crude ink line drawing. Stars: 13 outlined on the canton arranged in diagonal (from lower hoist to upper fly) rows of 4-5-4 (diagonally staggered). The stars are small but it appears some are five-pointed and some may be six-pointed. Canton: extends to the 5th stripe. American; 1787; Original at the Detroit Institute of Arts. 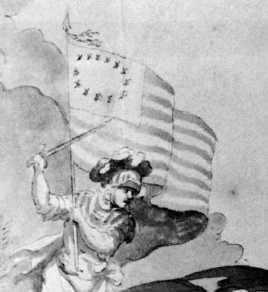 This watercolor sketch is the earliest showing a stars and stripes flag of at least five versions of this scene painted by Trumbull. See numbers 32 and 42, below. The Detroit Institute of Arts also has another watercolor sketch of this scene by Trumbull with a very undefined US Flag. Stars: 13 W stars on a B canton arranged in an oval. The painting is too indistinct to determine the number of points on each star. Stripes: 13 R-W-B, 5 R, 4 W, and 4 B. 1. U.S. 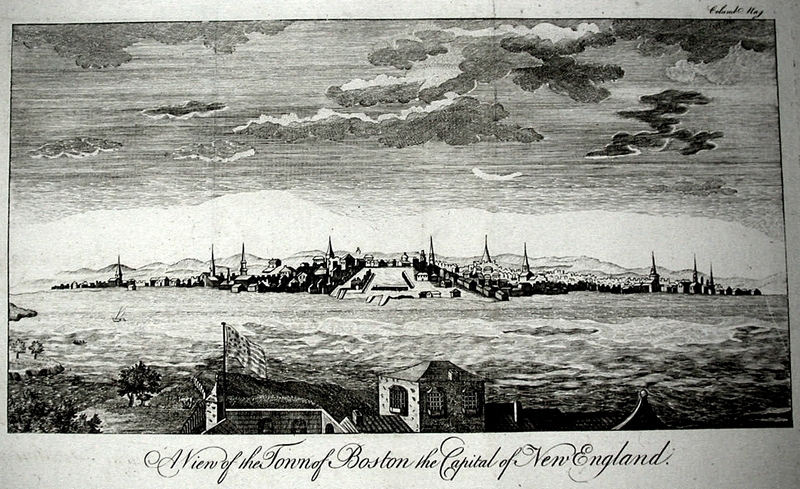 Flag in engraving made at Philadelphia for the Columbian Magazine entitled "A View of the Town of Boston, the Capital of New England". The flag in this scene is possibly an artist's impression of the Fort Independence Flag (See flag number 8, above). Stars: 13 5-pointed dark on light, arranged in three rows of 5-4-4 (staggered). Canton: Light, extends to the 6th stripe. "Rests" on a W stripe. Stripes: 11 dark and white, 5 dark and 6 white. Note: This image was added subsequent to the original article, hence the numerical designation 26.1. American; 1787-1797; Original at Yale University. Stars: The stars are somewhat indistinct but appear to be 13 four-pointed W stars on a B canton arranged in a square of 12 with one in the center. 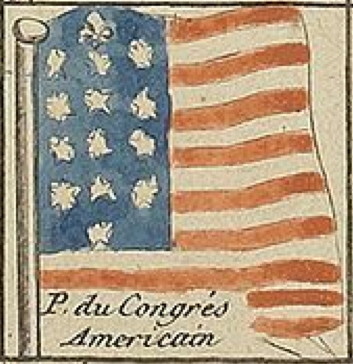 American; 1788 July 23; Original at the New York Historical Society. 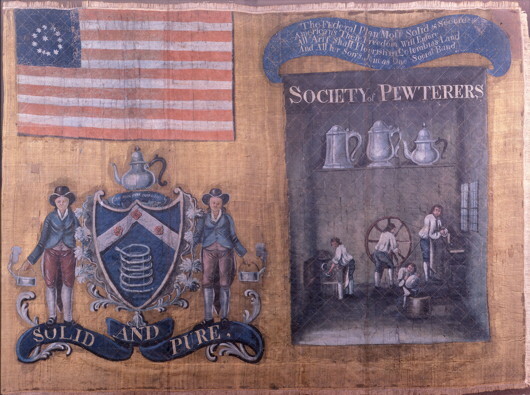 Flag shows the arms of the Pewterers as well as a view of a Pewterer's shop in production and a poem. It was used in the Grand Federal Procession held in New York City to celebrate the adoption of the US Constitution. 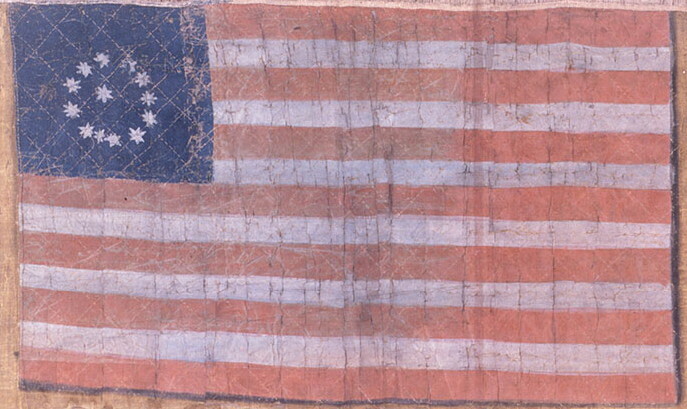 It appears to be the oldest positively-dated Stars and Stripes flag. It is fringed. Stars: 13 W stars on a B canton arranged in a circle of 12 with one in the center. The stars have points of 7 and 8, apparently 8 seven-pointed and 5 eight-pointed. French; 1789; Original owned by the United States Mint. Engraved by A. Dupré Paris. 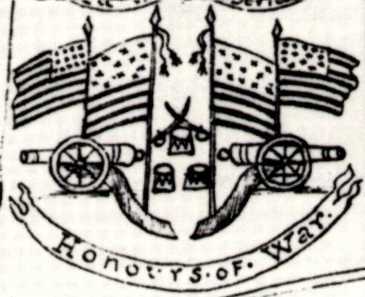 This medal shows at least three US Flags, two as described below and one in the background that may have just stars in the canton. The British flag is incorrectly shown as the English arms, three lions. Stars: indistinct number arranged in arc over US Arms in canton. Number of points indeterminable. 1. U.S. 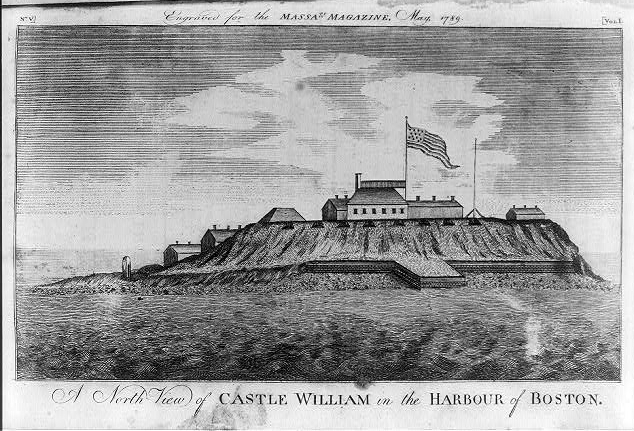 Flag in engraving made at Boston for the Massachusetts Magazine entitled "A North View of Castle William in the Harbour of Boston". The flag in this scene is presumably an artist's impression of the Fort Independence Flag (See flag number 8, above). Stars: 13 multipointed (probably intended to be 5- or 6-pointed) dark on light, arranged in four rows of 5-3-3-3 (staggered). Canton: Light, extends to the 9th stripe. "Rests" on a W stripe. Image Source: Matthew Larsen; original is in the Library of Congress. Note: This image was added subsequent to the original article, hence the numerical designation 29.1. French; 1790; Original in the Smithsonian Institution. 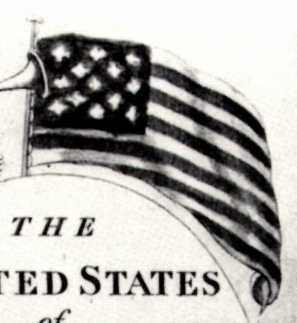 This is a copy of a 1786 design that has a slightly different flag design. The earlier print is described as having 13 dark stars arranged 4-5-4 on a light canton and 13 dark and light stripes. Stars: 12 five-pointed dark stars on a light canton arranged crudely to approximate a square of eleven with one in the center. Canton: extends to the 11th stripe. "Rests" on a very dark stripe. Stripes: 21 alternate light, darker and very dark, 7 light, 7 darker and 7 very dark. American; 1790; Lithograph copy at the Chicago Historical Society. The lithograph is inscribed "Drawn by Capt. Jona. Heart U.S.A. 1790." and "Oncken's Lithography, Cincinnati, O." Lithography is a nineteenth century technology. Although the original is probably in color, the illustration is only given in monochrome. The text states the top and bottom stripes are red. Stars: very indistinct, appears to be 12 or 13 light stars on a dark canton arranged in horizontal rows. Points indeterminable. Stripes: 11 alternate dark and light, 6 dark and 5 light. American; 1790? Original owned by William Appleton Aiken. 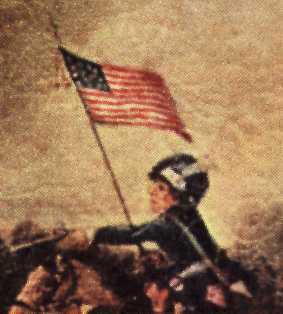 This painting is the second showing a stars and stripes flag of at least five versions of this scene painted by Trumbull. See numbers 26 (above) and 42 (below). Stars: presumably 13, although indistinct, W stars on a B canton arranged in an oval. Points on stars indeterminable, although appear to be more than five. Stripes: 13 W-R, 7 W and 6 R. W stripes appear much wider than the R stripes giving the impression of a W field crossed by 6 narrow R stripes. 1. U.S. Ensign as Initial letter engraving on Bill of Lading form made out for sugar and rum carried by the Brig Mary and landed at Philadelphia. Stars: 13 4-pointed W, arranged in rows of 3-2-2-2-2-2 (even). Canton: Dark, extends to the 7th stripe. "Rests" on a W stripe. Note: This image was added subsequent to the original article, hence the numerical designation 32.1. American; 1791-1792? Original at the North Carolina Hall of History. 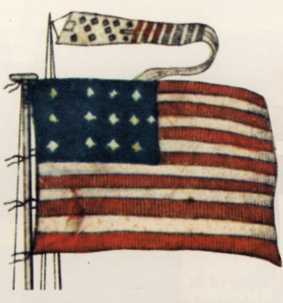 Grace Rogers Cooper assessed this flag as being 18th century but probably after 1795 due to the evidence of at least 14 stripes and the conjecture that there were probably more stars. Experts have agreed with her assessment. 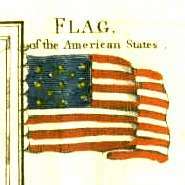 However, ignoring any conjecture and considering only the physical evidence of 14 stripes and 13 stars, one cannot escape the equally likely possibility that the flag was only what it appears today, with a 14th stripe added for Vermont which was admitted in 1791 but before Kentucky was admitted in 1792. This flag is very unusually long and narrow with a very long canton. 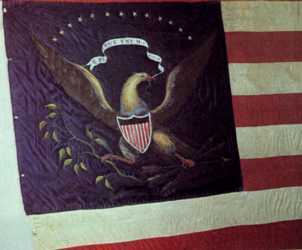 Even if it was a 15 star 15 stripe flag, it could date as early as 1792 when the 15th state was admitted. 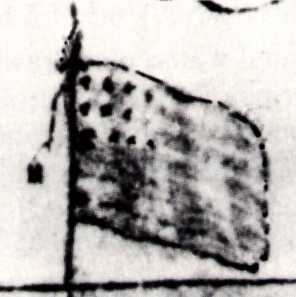 Coloring is suggestive of another Carolina flag, that of the Warship South Carolina (see #34, below). Stars: 13 eight-pointed B stars on a W canton arranged 4-3-4 (staggered) with 2 placed at the fly end of the canton (staggered vertically). Canton: extends to the 8th stripe. "Rests" on a B stripe. Stripes: 12 B-R complete and small pieces of two additional at the bottom, making 7 of each. American; 1793; Original at the Peabody Museum. Coloring is suggestive of another Carolina flag, that associated with Guilford Court House, North Carolina (see #33, above). Stars: 13 unusual B four-pointed stars with R dots between the points on a W canton arranged with 12 in a square and one in the center. Canton: extends half way into the 8th stripe and is W bordered on all but the hoist side in R. "Rests" half way into a B stripe. Stripes: 13 R-B, 7 R and 6 B.
German; 1793; Original at the Mariner's Museum. Stripes: 13 R-B-W, 5 R, 4 W and 4 B. 1. 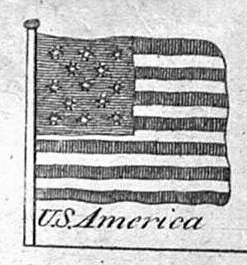 Flag of the American States on map of "North America", engraved by Samuel John Neele (1758 - 1824), published by G.G. & J. Robinson, London. The map and flag are hand colored. Canton: B, extends to the 7th stripe. "Rests" on a W stripe. Stripes: 13 R and W, 7 R and 6 W.
Image Source: Daniel I. Caplan, MD. Note: This image was added subsequent to the original article, hence the numerical designation 35.1. 2. 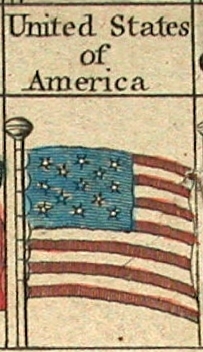 U.S. America (Flag) on chart from Rees' Encyclopedia. This chart was purchased separately from the encyclopedia it purports to come from. Source is assumed. Stars: 13 6-pointed W, arranged in rows of 3-2-3-2-3 (staggered). Canton: hatched B, extends to the center of the 8th stripe. 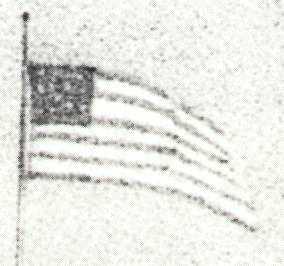 Does not "rest" on any stripe; rather it extends to the center of the flag. Note: This image was added subsequent to the original article, hence the numerical designation 35.2. 3. 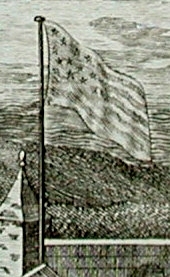 U.S. Ensign on flag chart entitled A View of the Flaggs that are to be found at Sea in all Parts of the World published in London by Laurie & Whittle. British; dated May 12, 1794. Stars: 13 5-pointed W, arranged in rows of 3-2-3-2-3 (staggered). Canton: Blue, extends to the 7th stripe. "Rests" on a W stripe. Stripes: 13 red and white, 7 R and 6 W.
Note: This image was added subsequent to the original article, hence the numerical designation 35.3. American; 1795; Original at the Henry Francis DuPont Winterthur Museum. Stars: 10 W stars on a B canton, arranged 4-3-3 (even). Due to small scale, stars are multi-pointed (probably greater than 5) but indistinct. Canton: extends to the 9th stripe. "Rests" on a R stripe. Stripes: 19 W-R, 10 W and 9 R.
Italian; 1796; Original at Brown University. Known as the Scotti Flag Sheet. The five flag illustrations are hand colored. Also included in this illustration is an American pennant. Stars: 13 W four-pointed stars on a B canton arranged 4-5-4 such that 4 stars in each row are centered over each other and the 13th star is placed in the center of the fly end of the canton. Stars: 13 W four-pointed stars on a B canton arranged in vertical rows of 4-2-1-2-4 (staggered vertically). Stars: 13 W four-pointed stars on alternate squares or W and B (7 W and 6 B) at the hoist. Stars: 12 W four-pointed stars on a B canton and a R cross of St. George (fimbriated W) bearing a 13th star in the center. The stars are arranged diagonally in imitation of the Cross of St. Andrew. Canton: extends half way into the 7th stripe. "Rests" half way into a R stripe. Stars: 13 W four-pointed stars on a B vertical stripe at the hoist, arranged in 2 vertical rows of 7-6 (staggered). American; 1797; Original at Yale University. 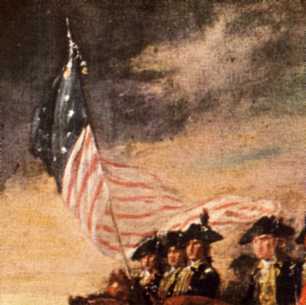 This painting is the third showing a stars and stripes flag of at least five versions of this scene painted by Trumbull. See numbers 26 and 32, above. The fourth is the very large painting in the US Capitol painted between 1817 and 1824 (closely--but not exactly--modeled after this painting). Stars: 13 W eight-pointed stars on a B canton arranged with 12 in a square and one in the center. Canton: apparently extends to the 6th stripe. "Rests" on a R stripe. Stripes: the stripes on the flag in this painting were painted in such a way as to be of various numbers depending on which part of the flag you are examining. In one place, there appears to be 14 stripes; in another there appears to be 18. They alternate R-W and there appears to be an even number of each. American; 1795-1800? Original at Yale University. It should be noted that this painting also depicts an incorrect British Union Flag. 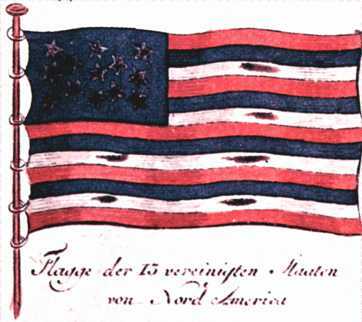 Generally, it is believed Kemmelmeyer painted his works before 1800, but the 17 stripes on this flag suggests possibly later, between 1803 and 1812. See # 22. Stars: apparently 13 W stars on a B canton arranged either in a square or a circle with one in the center. Scale is too small to determine exact number or the number of points on each star. Stripes: 17 R-W, 9 R and 8 W.